There are several ways to have a good time outdoors, but only a handful can be eye-opening and move your spirit like solo camping trips. The thought of being the only person within a couple of miles is refreshing. Your only company is the beautiful scenery, fresh air, sounds of nature and your thoughts. Solo camping lets you have the feeling of inner peace and tranquility. The peace that comes from within makes you keenly aware of the world around you. Solo camping gives you a chance to break from interaction with other people. Solo camping makes you more peaceful, balanced and secured when you get back to the real world. Most first-time campers ask themselves, "What do I need for my first solo camping?" 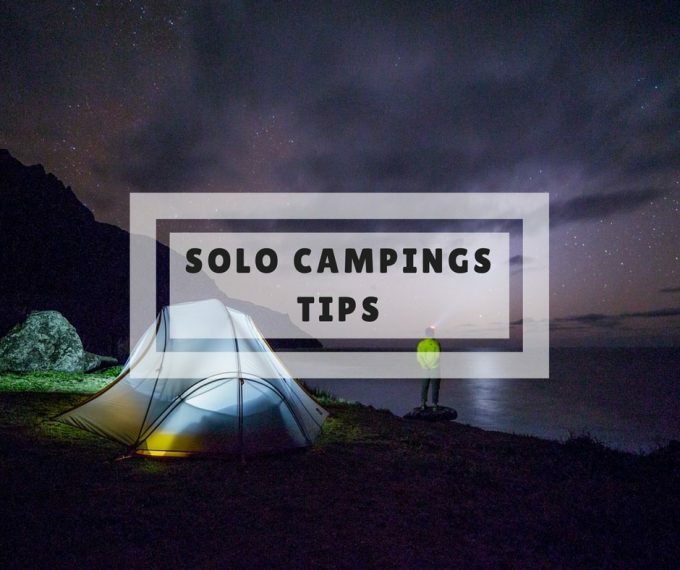 To make your camping experience even more exciting, you need to be familiar with solo camping tips. 3. Create a Checklist and Double up on the Essentials. When picking a location, do some extensive research to guarantee your comfort and safety. Research the site online and have a look at the reviews. If the place has too many negative reviews, skip it and look for another place to camp. Remember to obtain the campsite permits and any other permits that may be required. If you arrive at your preferred location and your guts tell you something is not right, just leave. Choose a place that is free from significant predators, poisonous creatures, and other human threats. Early preparation saves you from last minute inconveniences. Once you have given thought to the location, the next step will involve being well-prepared for the solo camping. Make a budget and try and work within it. If the costs become expensive, try to cut off some unnecessary items. Better yet consider campsites in your area that allow free tent camping. Some campgrounds require campers to make a reservation up to 3 months in advance. A checklist will ensure that you don’t forget to carry anything important on your camping trip. Start by listing the most important things on the top. Important info includes your contact information, emergency numbers, existing medical conditions or allergies and your blood type. Include the following in your checklist: a First Aid Kit, proper medication, gloves and protective clothing when necessary, safe and comfortable footwear. Carry extra food and water and avoid ingesting intoxicating substances. Other essentials include buck knife with sheath, a compass, a refilled lighter or waterproof matches, picnic utensils, and personal effects. Remember to keep a copy of your checklist in your car. Reach out to the office or ranger station and request for a copy of the rules and regulations. The last thing you want when camping alone is to find yourself on the wrong side of the law. Go through the laws and regulations and ask for clarification where you do not understand or regarding anything you may need to know. A map of the area is available on request. The map may show restricted areas that you are not allowed to go. Do not ignore the warnings. They ranger may ask you a few questions which is perfectly normal. Take note of the climate of the area in which you are camping. It is good to know what you are getting yourself into. Understanding the environment helps you to avoid undesired and potentially disastrous circumstances. Once you are well aware of the local climate, select your choice of supplies and clothing wisely. This will help you avoid overheating and dehydration in hot climates, freezing in cold climates and many more issues brought about by improper preparation. As mentioned, you can request a copy of the camping area map. Directions are essential when camping. You can obtain driving directions from Google maps, MapQuest, Yahoo! Maps and Expedia. If you are using a smartphone or tablet, make sure it has enough charge. Consider purchasing a power bank to prolong battery life. Calculate the mileage to be traveled and get an estimated cost of gasoline. You do not want being stranded in a strange location. If possible, carry some extra fuel with an air-tight jerrican for emergencies. Make sure you have the right gear when you go camping alone. Avoid carrying too heavy or too complicated equipment. Carry equipment that is easy to set up without the help of a second person. Dome tents are a favorite among many solo campers because they can be set up easily. They may require a little patience and skill to set them up right, but you will become a pro as time goes. Alternatively, some tents require no assembly. You simply fold them up, and you are good to go. If you’re short on cash, consider renting a tent instead of buying a new one. If you are bringing camping gear that you have never used before, test it at home to make sure you can set it up without any external help. This will save you unnecessary headaches trying to set them up yourself in the woods. You never know what could happen to you when you are out alone. When you camp with a partner, you have someone to talk to and share your concerns. When you are camping alone, it is advisable to shift the attention to any person coming your way. You may come across people with similar interests to yours and maybe learn a thing or two. If you are stranded, they can lead to a local eatery that you would never have found on your own. Solo camping trips give you the opportunity to be you. You do not have to pretend to please someone else. There is no reason not to be authentic. Forget about what people want you to be and spend time on whatever you want. If you are a music lover, remember to carry your guitar. If you love poetry but never have time to finish or write your poems, carry your poetry book and pen. Connect with yourself more. You will be more inspired by nature than being alone in your room at home. We can’t stress this enough. Just because you are alone does not mean that you should be bored. There are many activities to engage in and places to explore. You do not have to stay at your campsite the entire time of your trip. The main reason you decided to camp alone is to have some alone time. Camping gives you the opportunity to spend much time in nature by yourself. With the right skills, tools, and practices, you will easily transfer to a comfortable time in the campsite. Do not worry about what is happening around you, focus on the present and make it beautiful. When planning to go camping alone, it is imperative to put serious thought into your safety concerns. You have no one else to rely on suppose you face a life-threatening incident. You have to know that the more secluded you are, the more the probability of an accident or illness occurring you. Camping a long distance from the nearest paved road is therefore not a good idea. Injury and illness can occur at any time. For starters, most camping sites lack reliable cell phone reception. Try and look for a site with reliable reception in case of emergency. You will have a lot of spare time on your hands. You may want to carry a hacky sack or a book from your favorite author. It can easily become boring by yourself if you lack something to occupy your daily routine. Solitary camping provides you with an enjoyable and unique experience. People camp alone for various reasons; your camping buddy is canceling last minute, or all your friends have other plans. Few people camp alone for the peace and tranquility that solo camping provides. Camping solo may be risky if proper precautions are not taken to secure your safety. Some of the unpleasant experiences are avoidable through the discussed solo camping tips.